Carolin is 26 – and the love of her life just died. Really dead, not just figuratively dead. In her grief,she has to compete with her conservative ex-boyfriend for a (not exactly small) inheritance. No wonder that Caro gets drunk for the first time in her life, goes to a therapist and spends a small fortune on shoes. And feels surrounded by idiots. Luckily, in her darkest hours, Carolin isn’t alone, and her worried family and a stuffed fox-terrier named “number two hundred and forty-three” help her with a new beginning. 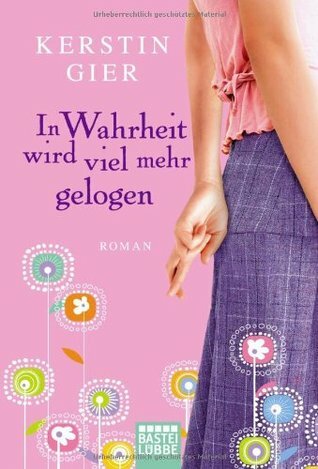 A typical Kerstin Gier book, in all the good ways; easy to read and follow, funny, unique main character and fascinating story line. On top of that, this one was set in the Mütter-Mafia universe. A total plus, because I loved those stories! Let’s start with the main character. She has an IQ of 158. This is shown in some of her characteristics, some which are a bit stereotypical, others less so. For example, she’s amazing with numbers, a great musician on several instruments, and communicates just like any other person. Her life is not dramatically different from any other person. She realizes most people don’t appreciate it when someone brags about their talents, which is why she doesn’t talk about it most of the time. A very (to me) relatable situation. She also constantly feels surrounded by idiots (Why do people ask: “what you’re doing here?” when you’re in a supermarket?). The Mütter-Mafia universe was really funny. This book is a little less so, but then again, it deals with the dead of someone’s husband. Therefore, less funny seems appropriate. It is however, still quite funny. It’s also great to find out a little bit more about those characters from a completely new point of view. I love it when writers set completely different stories in the same universe, so that characters meet! Saying anything more about this book, would probably just ruin the premise. I would suggest you’d read this yourself if any of the above sounded interesting!